AU’s Students Are the Most Politically Active in the Country | American University Washington D.C.
American University is the nation’s capital for politically active students. The Princeton Review has named AU No. 1 in its Most Politically Active Students category. The rankings, released this week, are based on a survey of 122,000 students at 373 schools throughout the country. AU’s 2010 ranking marks the third time in the last five years it’s topped the category. Nearly 10 percent of AU’s student clubs are politically oriented, and students in all of the university’s schools and colleges find their way into the political realm. 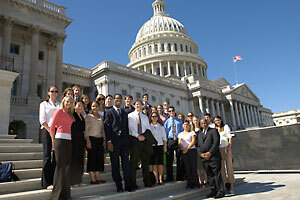 This spring, 13 AU students interned in a congressman’s office, 15 in a senator’s, and two at the White House. The ranking is not news to government agencies, which recruit heavily on AU’s campus. There were 42 federal, state, and local government employers in attendance at the fall 2009 Job and Internship Fair or spring 2010 event. That’s according to the AU Career Center, which ranked as the 15th best in the nation in the Princeton Review survey.